THE FIRST NIGHT ON BUTARITARI was marked by energetic enemy activity. No air attacks were delivered, the limited air power of the Japanese having been concentrated on the Southern Carrier Force off Tarawa, but ground fighting was continuous. Some of the enemy who had been left during the day's fighting in the western area tried to work their way eastward to rejoin their own forces. Others moved back from the east into areas which had been cleared on D Day, either to harass the invaders in their many fox holes or to set up machine guns in positions of advantage for the following morning. Before the night was over, they had succeeded in preparing at least seven such positions, and had infiltrated into the company perimeters enough to inflict a few casualties and cause much sleepless anxiety. Moving in total darkness, the Japanese used many ruses to discover the hidden locations of the American troops. The men had been ordered to observe complete silence. They even struggled to control their coughs by chewing on handkerchiefs and shirtsleeves. When an armed Japanese came to a perimeter and called out, as several did: "Psst! Hey, Sarge!" he was therefore readily recognized as an impostor and shot. Although this disposed of that offender, the spurts of flame from rifles revealed targets at which other Japanese promptly fired rifles or threw grenades. At some points snipers in trees dropped firecrackers, the explosions of which resembled Japanese rifle fire enough to draw response from excited Americans. Snipers then shot into the foxholes revealed by gun flashes. When one captive was taken to the 1st Battalion aid station, he attracted enemy fire by making loud animal noises until he was clubbed into silence. 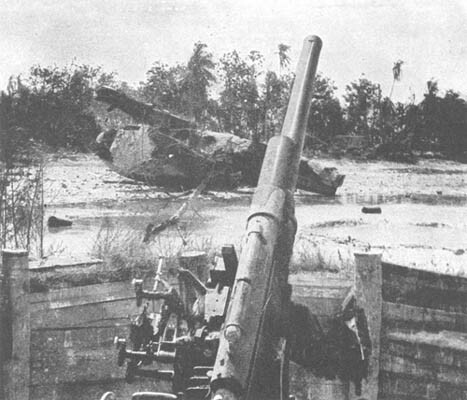 ENEMY DUAL-PURPOSE GUN on base of King's Wharf, and behind it, in cove, wreck of a Japanese seaplane in which snipers gathered during the first night of the operation. Their fire on the 2d BLT was stopped finally by an explosion caused by shells fired from our tanks. approached, their boldness increased. One crawled to the edge of it fox hole and, as he was observed, blurted out: "Me no got gun." He was instantly shot, and fortunately so, as morning showed that he had died while taking aim. Another foolhardy enemy soldier, just before dawn, used irresistibly fighting language by walking along the lagoon shore shooting: "Reveille, fellows! Get up! Reveille!" from Company A, it sniped all night at Company B in its front, and when detected in prone positions at dawn, all its members were surprised and killed. In the rear of Company B's area, another patrol of ten was discovered at 0700, advancing through the woods in single file. Two men destroyed it with a BAR and some hand grenades. In the Yellow Beach area, snipers killed two tank men, who had left a foxhole to pursue an enemy soldier infiltrating into the tank park, and a third, as he climbed out of a tank shortly before dawn and became visible in the pate light of a waning moon. Much aimless shooting by "trigger-happy" men also occurred in that part of the island. In the early morning its volume increased. just after daylight, a man from the 152d Engineers ran along the lagoon shore from the direction of On Chong's Wharf toward the 2d BLT CP, shouting: "There's a hundred and fifty Japs in the trees." A wave of shooting hysteria swept the area, and men started firing at bushes and trees until the place was "simply ablaze with fire." When the engineer admitted that he had seen no enemy but merely "had heard firing," shouted orders to the men to cease firing proved ineffectual. Direct commands to each individual soldier were necessary. The harassing tactics of the enemy had been effective. The enemy was also successful in mounting machine guns in damaging positions. Two were set up near the lagoon, between the West Tank Barrier and the first bend of the road to the west of it. Five other machine-gun positions were established in the area around the sandspit and King's Wharf. 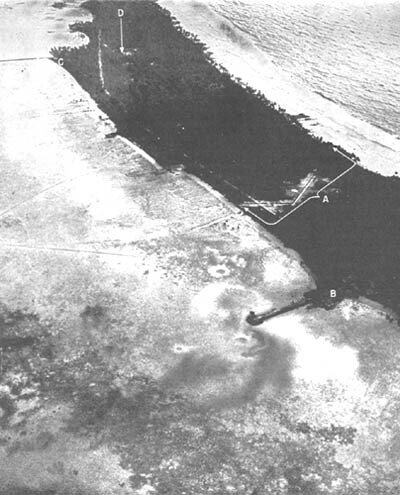 The wreck of a Japanese four-motored "Emily" (see illustration, p. 94) in the sandspit cove was utilized, as were a building on the sandspit, another building near the base of King's Wharf, and two emplacements at the base of the wharf and near the hospital structure there. MEDIUM TANKS SHELLING KING'S WHARF as the second day's operations commence at Makin. During the night Japanese machine gunners had infiltrated to positions at end of wharf from which, at dawn, they began firing on landing barges. The 75-mm shells silenced them. and commenced their investigation.1 Near Red Beach 2 Col. Charles B. Ferris, divisional G-4 assembled the special staff at 0600 and established the day's program for meeting supply problems, policing the roads, and caring for enemy dead. In the Yellow Beach area these were estimated at 200, while the main Japanese force was thought to be in positions within the "citadel" area just west of the East Tank Barrier. The problem of supply for the second day's action was difficult. The highway from the western shore had been under repair and was available for quarter-ton traffic by 0904. It was, however, under interdictory fire from Japanese snipers in the unreduced "pocket" (Map No. 6, p. 86), and perhaps from others. Had the approach to Yellow Beach been secure, the high water of morning might have been advantageously used; extraordinary efforts by the shore party might have built up the dumps to meet the requirements of the two BLT's operating in that area. But landing on Yellow Beach remained distinctly hazardous. 1. Air reconnaissance on D Day reported no military installations on Little Makin or any other island in Makin except Butaritari. The two hulks on the reef near On Chong's Wharf, which had been so heavily attacked from the air and the sea on D Day, were believed once more to have been made an active enemy firing position. As barges came in to Yellow Beach early on the second morning, some of them "returned" fire upon the hulks, aiming at their top decks. On shore, among troops stationed in and near the West Tank Barrier clearing during the night, intermittent bursts of machinegun fire were received for as much as two hours after dawn. They may have been "overs" directed toward the hulks from the barges. At 0818, while the barges stayed clear, the first of a long series of air strikes which continued until 1630 that afternoon began against the hulks. At 0920 some of the medium tanks went to the water's edge and shelled the hulks with their "75's." They were reported to be overshooting by some 2,000 yards, furnishing a fire which boats entering the lagoon were unexpectedly obliged to face. Whether from enemy or friendly fire, the approach to Yellow Beach was so dangerous for the small barges that, as late as 1230, about 40 of them were circling well out in the lagoon waiting for the signal to come in, and by that time the tide was ebbing. To free the line to Red Beach 2, an effort to destroy the Japanese in the "pocket" began as soon as heavy fire believed to be from the enemy there opened at 0800, upon Company C. S/Sgt. Emanuel F. Defaces and a patrol went into the pocket from the east, and then again, from the northeast, in each instance finding fire too severe to continue. In some manner not recorded, it became possible for Major Mahoney, 1st BLT commander, to report at 0840 that Company C had terminated opposition from the "pocket" and was taking steps to contain the area while it was combed for hiding snipers. 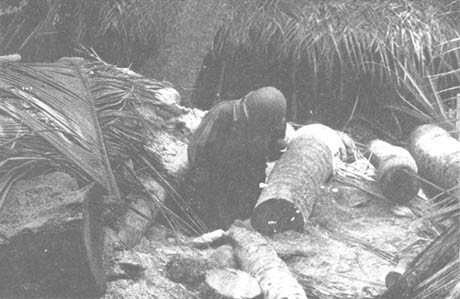 The boldest sniper action came from a coconut grove along the eastern edge of the West Tank Barrier clearing, just north of the middle of the island, At about 1030 a group of Japanese opened up with rifles and light machine guns upon the 1st Platoon, Company F, inflicting no casualties but promoting determined steps to silence them. Stray shots came flying into Company F's CP near the center of the island, and Captain Leonard therefore asked urgently for three light tanks to move against the source. To reach a position from which they could fire canister into the grove without endangering friendly troops, the tanks moved to the northern end of the clearing, beside the highway; their line of fire was then toward the ocean. About five minutes after they began spraying the tree tops, under directions from 1st Lt. Edward J. Gallagher as he stood on one of the tanks, a fourth tank came along the highway with fuel in tow. Its cable snapped. Capt. Charles B. Tobin and Sgt. John S. Sloane climbed out of it to investigate and at once came under sniper fire. The three other tanks covered them while they crawled back into their own vehicle. Before the four tanks had dispersed, a navy bomber suddenly swung over them at a very low altitude, and from its opening bomb-bay hatch, a 2,000-lb. "daisy-cutter" fell, striking ground about 25 feet from Captain Tobin's tank on the highway. Lieutenant Gallagher, Pfc. John E. Costello, who was covering him from the base of a nearby tree, and Cpl. Elmer F. Conway, who was in a foxhole, were all killed, and two sergeants were wounded, while other tank men were injured by the concussion. By the time the crews had recovered the snipers were forgotten. They gave no further trouble. 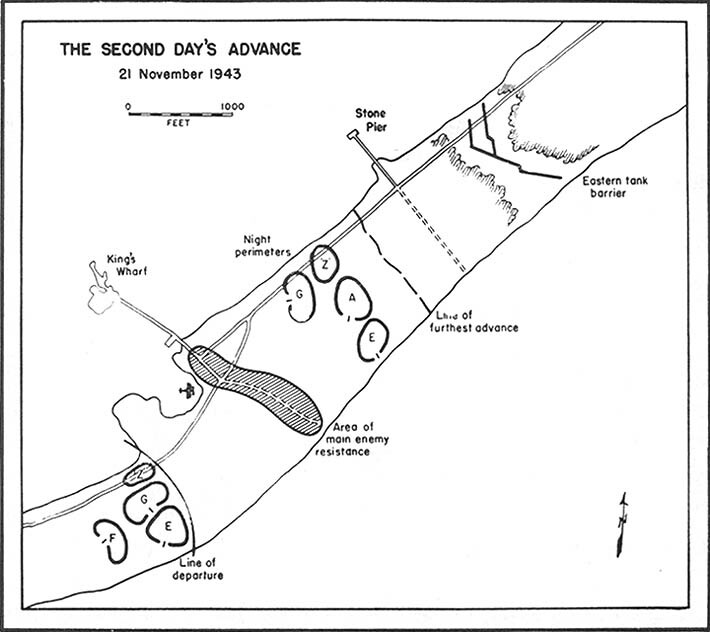 The plan of attack for the second day provided that Company E and attached elements should push along the island toward the East Tank Barrier, while Company F remained in reserve near Yellow Beach; the 1st BLT was to clean out the snipers near the West Tank Barrier and thence westward toward the Red Beaches. Hopes of an early start were disappointed, for Colonel McDonough elected to defer the advance of the infantry until the tanks were ready, and these were delayed until enough fuel could be brought to them for the projected advance. The artillery barrage which began at 0700 was continued until 0820, and resumed from 0945 until 1010, with 783 rounds fired by nine 105-mm howitzers. At 0835 bombing and strafing of the area ahead of Company E as far as the East Tank Barrier were requested at once. They were quickly supplied, and only when the tank fuel had arrived at 1000 and the tanks were almost ready was the time of the attack advanced from 1100 to 1045. Stoppage of air support was requested at 1623; "Tanks and troops moving forward" was given as the reason. Although this request was acknowledged and confirmed, the air column formed for the bombing runs over the area kept coming as originally ordered. (see illustration, p. 96), in which a gun had been put up during the night. At the same time, planes were strafing the corresponding positions on Stone Pier, which they attacked repeatedly from 0910 to 1100. By 1110 the attack was in progress. Ten medium tanks had been refueled and moved to position in support of the troops. The troops had emerged from their slit trenches as the planes roared off and the dropping of 2,000-lb. "daisy-cutters" came to an end. soon formed and advanced eastward with the medium tanks at either flank (Map No. 7, p. 100). On the extreme left was Special Detachment Z, 105th Infantry. Next to it came the 1st Platoon, Company G, which had reinforced the 3d Platoon, Company E, throughout the night. In the right center was the 1st Platoon, and on the right wing, the 2d Platoon, both of Company E. All units moved forward in skirmish line. Fifty yards back, mopping up the Japanese snipers, was a second formation consisting of the 3d Platoon, Company E, and the 2d and 3d Platoons of Company G, and the marines. They moved first over the area covered late on the previous afternoon, from which Company E had withdrawn for its secure night position. The line advanced steadily and aggressively, but slowly, averaging about three yards a minute. "On the second day we did not allow sniper fire to deter us," explained 1st Sgt. Thomas E. Valentine of the front echelon of Company E. "We had already found that the snipers were used more as a nuisance than an obstacle. They would fire, but we noted little effect by way of casualties. We learned that by taking careful cover and moving rapidly from one concealment to another we could minimize the sniper threat. Moreover, we knew that our reserves would get them if we did not. So we contented ourselves with firing at a tree when we thought a shot had come from it and we continued to move on. Our reserves could check on whether we had killed him or not." In the area west of the underground CP, which had been covered during the previous afternoon and then relinquished for the night, the enemy once more fell back. In the next 200 yards, however, from the CP to the road which crossed the island from the base of King's Wharf, the stiffest resistance of the day was met. In spite of the artillery and air bombardment, the enemy delivered a strong fire in this area from several positions, including those prepared during the night. 1. From the air an explosion in the seaplane was observed at 1146. 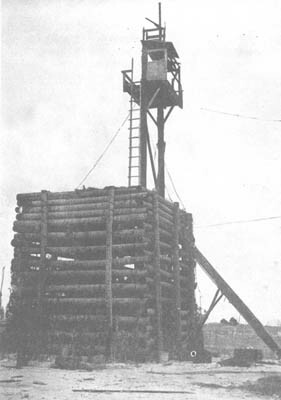 OBSERVATION TOWER at the base of King's Wharf from which enemy snipers were cleared quickly during the advance on D plus 1.
landings from the ocean, three dual-purpose, 3-inch guns were operated from the ocean shore for a while, but were eventually abandoned amid a litter of empty shells before the infantry closed in. Beyond these guns, at the ocean end of the cross-island road, a twin-barreled, 13-mm, dual-purpose machine gun also covered part of this zone of advance. In the center about 30 yards beyond the CP was a large underground shelter, and about 30 yards farther, 6 rifle pits connected by a trench. Squarely across the King's Wharf road, a little south of the middle of the island and running east and west, was a longer trench with 11 rifle pits. 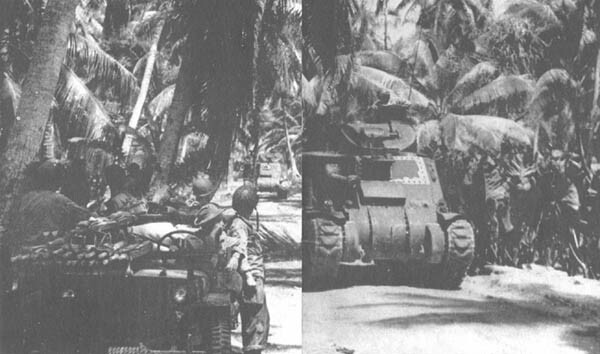 At the left center, as they approached the road, the 3d Platoon, Company G, entered a grove of hardwood trees which stretched on toward the East Tank Barrier, while in the right center and on to the ocean, the 1st and 2d Platoons, Company E, moved among coconuts and small clearings. There, as well as in the prepared emplacements, Japanese machine gunners took temporary positions, and snipers fired persistently. MANY BOMB SHELTERS were constructed like this on Butaritari. Larger dugouts were used as machine-gun emplacements. During air strikes on 19 November the enemy entered many and remained until blasted out by grenades, TNT pole charges, or shells from our tanks. JAPANESE RADIO TRANSMITTING STATION for long-range communication was situated in this heavily revetted frame structure near center of Butaritari Island. It was the counterpart of a long-range receiving station located within main fortified area near King's Wharf. the base of King's Wharf, on which three dual-purpose guns and one antiaircraft gun were placed, and on which three machine guns had also been installed during the night. The operations of the advancing front consisted principally of eliminating pillboxes, dugouts (see illustration, p. 103), and log-revetted emplacements. Coordination between tanks and infantry ran much more smoothly than on the previous day. The infantry made frequent use of the offensive grenade, which raised a covering dust even when it fell short of the intended target. Thus bidden, men moved to the flanks and rear of the pillboxes. BAR fire, machinegun fire, and that from the tanks covered details crawling forward with blocks of TNT. When these charges were exploded at the entrances of installations, they either killed the occupants or sealed the exits. Occasionally the tanks rode onto the shelters to crush them with sheer weight. The tanks were used at all needed points along the line from ocean to lagoon. Ahead of the advance, the artillery on Ukiangong Point sent a creeping barrage from the King's Wharf road to the East Tank Barrier. Although no direct hits of significance fell upon pillboxes and shelters, the enemy was kept under cover. Japanese artillery was noticeably lacking, and enemy mortar fire was infrequent. Between noon and 1400, the advance passed through the area containing the structures of greatest importance to the Japanese. On the bulge in the lagoon shore from which ran the base of King's Wharf, along the island highway to the east, and in an angle formed by the highway and the King's Wharf road were the buildings used by the Japanese aviation personnel, and stores of fuel and ammunition. A set of hospital buildings was situated near the lagoon at the base of the wharf. Under coconut trees along the ocean shore at the right were two machine-gun emplacements, supported by ten rifle pits, the whole group being protected on the east and west flanks by double-apron wire running inland from the water across the ocean shore road. One after another, all the positions were overrun. INTERIOR OF ENEMY RADIO STATION shown on opposite page, with six complete transmitters arranged along the outside walls, from which antenna leads could be short. Cables were in trenches in the concrete floor; power distribution panel was on inside wall of this room. The enemy fought ineffectively as Company E and attached elements pushed steadily and thoroughly ahead. In its rear, Company A relieved Company F as battalion reserve at 1300, and moved to a mopping-up position some 200 yards west of the front line without incident. The worst of the enemy resistance had been met and overcome by 1400. Near the aviation CP, Detachment Z found at that time a circle of six dead Japanese officers, probably air pilots, who bad killed themselves, or each other, with revolvers. Working with the tanks, the line moved on for three more hours until it was about 1,000 yards from Yellow Beach and 200 yards short of Stone Pier and its cross-island road. By 1730, a halt was called. It was again time to prepare defenses for the night. The day's success wrested from the Japanese their largest radio receiving installation, a heavily revetted underground building, 78 feet by 33 feet, which lay at the northwestern comer of a 200-foot clearing east of the King's Wharf road, near two 60-foot masts (Map No. 9). 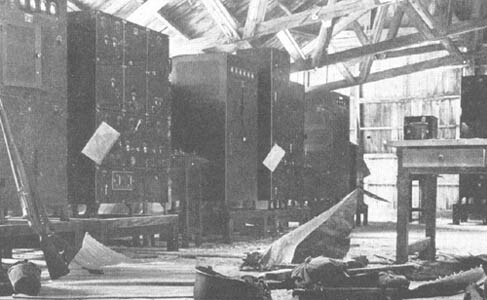 With nine receivers of identical type, it was the counterpart of a new transmitting station beyond the East Tank Barrier. Other installations captured or destroyed left the main area of enemy military positions entirely in American possession. Before them now was the East Tank Barrier system, resembling that at the west, but designed primarily to stop an assault from the east. Once it had been taken from the rear, little would remain except the radio transmitter station and the outpost defenses, scattered over the remaining half of the island. The buildings along the lagoon near the Government Wharf were old British structures erected for civilian purposes. Tanimaiaki village also lay ahead near the eastern tip (Map No. 8, p. 110). At a cost of 26 wounded and 18 killed in battle, not including those killed and wounded by bombing accidents,1 the second day's advance had consumed enough of the enemy's waning power to make certain that the third day's operations would be conclusive.2 No withdrawal to the east on any sizable scale had been observed from the air during the day; presumably the enemy were to stand in the East Tank Barrier system. 1. The medical report for 21 November shows that of the 15 received at the clearing station, 2 died and 13 were wounded. 2. No estimate of enemy casualties was officially computed, but isolated reports of those killed by the bombardment, by American ground fighting, and by their own suicidal hands total 54. The second night on Butaritari approached with the problem of supply still unsolved, but with Yellow Beach at last free of fire from the much battered hulks. They were reconnoitered late in the afternoon by a patrol of 16 men from Company C under 2d Lt. Everett W. McGinley. The patrol went out in two Alligators, boarded the structures, and discovered the top deck of each to be so wrecked and twisted that "no enemy could have fired from it without being in plain view." No evidence of enemy occupation was found, and the patrol returned with a negative report.1 The fire which had been attributed to enemy emplaced there was quieted by nightfall. On Red Beach 2, a bulldozer worked late under artificial light to clear the beach for the next day. After first ordering the transfer of unloading operations from all vessels except the Pierce from Red Beach 2 to Yellow Beach, Admiral Turner was persuaded to revise the plan and permit the fullest use of Red Beach 2 for another day, since the conditions at Yellow Beach were shown to be unsuitable for as heavy an inflow as he had intended. At 1630 Company A was ordered to relieve the advanced elements of Company E and Company G. The latter withdrew to the lagoon shore west of Company A and dug in. About 1830 Company E also retired from an even more advanced position to a line about 300 yards west of the Stone Pier road. In the center of this line, Company A established its perimeter and to the north, next to the lagoon shore, was Detachment Z, 105th Infantry (Map No. 7, p. 100). For the second night, the naval forces retired from island waters to open sea. Among the men in the slit trenches and the various perimeters, matters were expected to go much as on the preceding night. They braced themselves for the sniping, the ruses, and the endless vigilance so necessary for survival. In the 3d BLT area near "Rita Lake," at the 105th Field Artillery position on Ukiangong Point, at the western beaches and dumps, and in the Yellow Beach areas occupied by Companies C, D, F, and H, the night brought peace and quiet. Elsewhere, expectations of trouble were fulfilled. 1. So convinced were some of the observers at Makin that Japanese had been using the hulks that they saw enemy fire directed from them at the approaching Alligators and observed the men of the patrol falling under the fire. Company B spread out to cover the West Tank Barrier. They took precautions which reflected the experience gained on the preceding night. Instead of depending upon rifles, they were instructed to refrain from rifle fire and to throw hand grenades. In front of one platoon, 30 yards of wire clipped from a Japanese trip-line was strung about 2 feet above the ground. Cans were placed to dangle from it, and to sound the alarm if the wire were touched. When three Japanese hit the wire, the barrage of grenades which landed among them killed one and drove the other two in flight to their death on the beach. Four other Japanese dead were found around the Company B perimeter in the morning. In the line across the island at the east, Company E at one wing and Company G at the other had relatively quiet nights with a short, brisk period of rifle fire against encroaching snipers in the early morning. The men of Company M, 105th Infantry, and Company A, 165th Infantry, in the center and left positions, suffered from grenade and mortar attacks throughout the night. The perimeters had been chosen with care to maintain visual contact and to retain fields of fire before them, Medicine was improvised by the aid station to prevent coughs from breaking the silence and imperiling those in the vicinity. Men who slept were roused at the first signs of snoring. Insect repellents made slapping unnecessary, but, on the other hand, were so strong that they led some of the enemy directly to a target through pitch darkness. as the Northern Landing Force approached. The largest component of labor troops, divided among Koreans and Japanese, had arrived on 15 May 1943 when 300 landed at Makin and were put to work on barracks, roads, fortifications, and the seaplane ramp. Part of the labor troops were the 111th Pioneers, under a Lieutenant Kurokawa and four lesser officers, while the bulk were in a detachment of the Japanese Fourth Fleet Construction Department. The natives on Butaritari had been expelled from the fortified area between the two tank barriers. Three captured American aviators, who had left before the attack, warned the natives in October to leave Butaritari if they wished to escape a forthcoming battle, but the Japanese forbade the natives to depart for any of the other islands in the atoll group. The Korean laborers were confined to barracks at night, but their observations during the day had included much of military significance. According to them, occasional freighters and transports, but no enemy warships, appeared at Butaritari. Air Force personnel was inspected semimonthly by an officer who flew in from Jaluit, while supervision of the garrison troops was exercised from Tarawa. A reconnaissance plane brought warning to Makin's garrison one day before the attack. 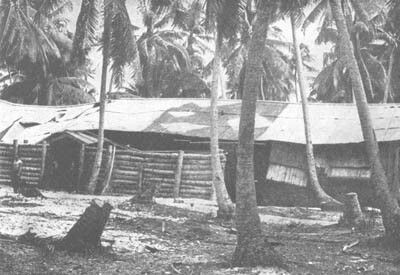 Troops on the island occupied shelters on both of the nights preceding the actual assault. When that began, the Japanese soldiers took cover in the best places and the Koreans took what was left. The latter remained under cover, although a few accepted an invitation to use arms in defense of the island. Air Force personnel may have left the defense wholly to garrison troops, as some of the prisoners believed, and certainly had abandoned hope of successful resistance by the second day, when several of their officers were discovered in a circle of suicides. Communications on the island were destroyed by the preparatory bombardment; concerted opposition by the Japanese was reduced to joint action by small groups and lacked a coordinated pattern. beyond the West Tank Barrier. In the early morning an expedition, guided by Major Herzog, would set out for Kuma Island to intercept any of the enemy who sought refuge there. Another party was to be detached for a less distant encircling movement, going through the lagoon to a point opposite the Bight, and establishing there a strong barrier line across the narrowest point in the island to stop any Japanese fleeing from the pressure of the 3d BLT. Preparations for these movements were made during the night and were greatly aided by a captured map showing trench systems and machine-gun positions. To deny rest to the enemy, harassing artillery fire was dropped in the eastern area from time to time. The long vigil of another tropical night after two days of battle left the men on Butaritari tense and excitable. At 0400 a sentry on the lagoon convinced himself that some small landing craft out in the lagoon were enemy reinforcements, perhaps from a relieving Japanese task force, which one of the prisoners had reported to be on the way. He roused Colonel Durand and Colonel McDonough in their foxholes near the shore. "There are 200 Japs out there," he reported Talking very loudly to escape being shot by their own men, the two officers walked to the beach and identified the boats as American. At 0600 on the morning of the third day at Makin, the 3d BLT moved along the island highway toward Yellow Beach. Company K elements led the column, a platoon of light tanks followed, and then, in order, Company I, the battalion's antitank platoon, headquarters, and headquarters company (less two platoons), medical units, and Company L in the rear. As the leading units strung out along the highway, an antisubmarine plane from the Liscombe Bay began the third day's air support, and at 0619 four planes from the Corregidor and seven from the Coral Sea started droning over the island on patrol. The ships returned from the open sea. Unloading was resumed on the beaches. The sun rose higher on another clear, hot, humid day. area at the left to the lagoon, and together they moved ahead in skirmish line. The other elements were in support. At 0700 artillery on Ukiangong Point started shelling the East Tank Barrier while Companies A, 165th Infantry, and M, 105th Infantry, withdrew. The line moved swiftly ahead across the area taken on the previous afternoon but abandoned during the night. At 0820 the artillery barrage was lifted. The tanks and infantry moved against the enemy. By 0915, the first 250 yards had been crossed with only light opposition. The advance knowledge of machine-gun positions gained from the captured enemy map was helpful to the tanks as they advanced. Resistance became more stubborn as they reached the road running south from Stone Pier (Map No. 9, inside back cover). The first zone of advance contained a stone church and other buildings, most of them constructed in the period of British occupation before the war. South of them, extending almost all the way to the ocean, were bobai pits and marshy gardens associated with the native village of Butaritari, The tanks were obliged to proceed in single file along the highway with the infantry on either wing until the advance reached the Stone Pier road. Then, from the air, they were observed to be spaced abreast along the whole line of advance, and moving forward smoothly. The tanks shelled the buildings ahead of them, while the infantry grenaded surface installations and small shelters. The combined tactics for the reduction of large shelters, developed in the two preceding days, were employed on four such installations in the zone of Company I, at the left. At 0934 a plane strafed a pillbox on the seaward edge of the tank barrier, while the leading tank was poking its way on to the base of Stone Pier, about 200 yards farther west and across the island. THIRD BATTALION, 165th Infantry marching, early on 22 November 1943 from the reserve area to continue the eastward attack. On this day they took the East Tank Barrier, advanced beyond the Bight, and when dug in for the night, resisted a series of suicidal attacks. EAST TANK BARRIER system, and its approaches (A). In foreground is Stone Pier with one of the two enemy radar screens at its tip (B). At far left appears part of Government Wharf (C), and opposite it, the clearing for one of the principal Japanese radio installations (D). was occupied; these emplacements covered the ocean shore all the way to the East Tank Barrier clearing and its defenses. At 0945, as the barrier defenses came within range of some of the tanks, the field artillery resumed its barrage also, first on the clearing and then to the east of it. After 25 minutes the shelling from Ukiangong Point stopped. The 105th Field Artillery Battalion then began moving to a new position in the former "citadel" area while the tanks and troops entered the zone which had just been shelled. With the 3d BLT's attack proceeding relentlessly eastward, Colonel Hart took steps to dam the stream of retiring Japanese by sending a special detachment ahead to stop them. For this mission, two reinforced platoons of Company A, which had spent the night in an advanced perimeter and had then been relieved to rejoin the 1st BLT, were sent with the additional reinforcement of one section of light machine guns and one platoon of heavy machine guns from Company D. The tired troops cleaned their weapons, filled their canteens, and embarked at 1100 in six Alligators under command of Capt. Lawrence J. O'Brien. A 3-mile run over the lagoon would bring them to a landing beach north of the Bight (Map No. 8, p. 110). At that point the island narrowed to a neck 150 yards wide, with a clearing in which machine guns were to be strongly placed. Shortly after noon they moved from an unopposed beach landing to set up the barrier, and at 1314 reported that, while sustaining no casualties themselves, they had killed or captured 45 of the enemy. They sent to Division Headquarters a friendly English-speaking native who warned of the passage of 40 of the enemy toward the east on the previous afternoon, some of them bearing arms. Beyond this water-borne, flanking operation, a longer reach was made by Maj. Edward Bradt and a special detail of men from Company M, 105th Infantry. Guided by Major Herzog, they went in ten LVT's to Kuma Island to prevent the retirement there of Japanese fleeing from Butaritari. Although one barge reconnoitered in the middle of the morning, the main movement was delayed until noon, and one of the Alligators became disabled en route. At 1400 the others landed without opposition at the northeastern end of Kuma and worked southwest along it. The ten enemy soldiers who were reported to Major Herzog on the previous day as having hidden on Kuma had already gone farther east. All others would henceforth be sealed on Butaritari as the 3d BLT pressed eastward. The East Tank Barrier defense system lay, like that at the west, in a clearing among the coconut trees which extended completely across the island. The highway ran through the north end by means of an offset bridge, crossing a wide and deep antitank ditch, and penetrating a break in a large log barrier a few yards farther east. The ditch covered three-fifths of the island's width, in the shape of an open "V" with the point toward the west (see illustration, p. 114). The other southern two-fifths was blocked by a heavy log barricade. West of these structures a curving trench linked a series of three interspersed by six machine-gun emplacements, four antitank emplacements, and over 40 rifle pits. The trench curved away from the advancing troops at the center in a shallow arc. Less than 50 yards in front of the center portion of the firing positions, a set of rifle pits, laid out in approximation of a "U" shape, were the first portion of the defense system to be met. JAPANESE TANKETTE, one of two found at Makin. Both had been abandoned in revetments and had never been brought into action. been moved from its protective bunker, and only one of which was seriously damaged, No fire was received from the antitank positions either, although two 37-mm antitank guns were discovered wrapped in tarpaulins, and fully equipped with ammunition; they had been abandoned in good condition behind the barrier without even being pointed toward the attacking force. On the ocean side, an undamaged 70-mm howitzer was found in position, also unused by the enemy. A few infantrymen cautiously infiltrated through the East Tank Barrier defenses and crossed the clearing unopposed. The rest then took the entire installation at a bound. More heavily fortified than the West Tank Barrier, this defensive system offered far less opposition. Tanks had passed the barrier and by 1042 were operating in the barracks area between highway and lagoon, 200-300 yards east of the defense system. Two hours later, when the Company A barrier was being thrown across the island neck, the tanks were in a clearing about 800 yards short of that line. The two forces were in communication, The Japanese between the two were about to be caught. Speedy advance by the 3d BLT brought it to the Company A line at 1330. No opposition, no sniper fire, no captives from either houses or foxholes marked its movement. The enemy remnants had either evaded discovery as the force moved ahead or had slipped east of the island's neck before noon. in the woods beyond the line, natives from a hamlet near the Bight had been hiding. While the 3d BLT rested, about 300 emerged. A cordon of troops surrounded them, and eventually conducted them to the rear. Its 45 minutes of rest over, the battalion resumed its progress toward the tip of the island, still more than 3 miles away, while Company A went to the rear. The easy advance of the 3d BLT had been cautiously executed. At this stage General Ralph C. Smith, in pursuance of the original plans, assumed full command of the island forces at 1510. He himself went on reconnaissance, as far as the line of advance, and addressed some 200 natives in the village near the Bight through their own magistrate, assuring them of friendship. When he returned to his CP, orders were received from Admiral Turner for the early reembarkation of the 1st and 2d BLT's, all the medium tanks, all except five of the light tanks, and all air and naval gunfire liaison officers. General Ralph C. Smith was asked to report as soon as possible his readiness to relinquish command to the commanding officer of the garrison force, Colonel Tenney. 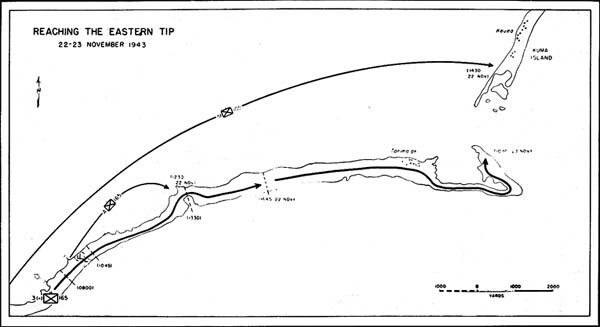 The 3d BLT continued some 2,100 yards beyond the Bight and stopped at 1645 (Map No. 8, p. 110). During the day, it had covered almost three miles of the narrow, bending island strip. The Japanese opposing force consisted of skulking, hidden remnants at best, if not simply of hunted individuals. Estimates of their number, based on what natives said they had seen, were diverse and unreliable, and indicated that many of the survivors were labor troops rather than members of the naval land force. After so little opposition Colonel Hart's battalion settled in for the night with less care than they might have shown had they known what lay before them. 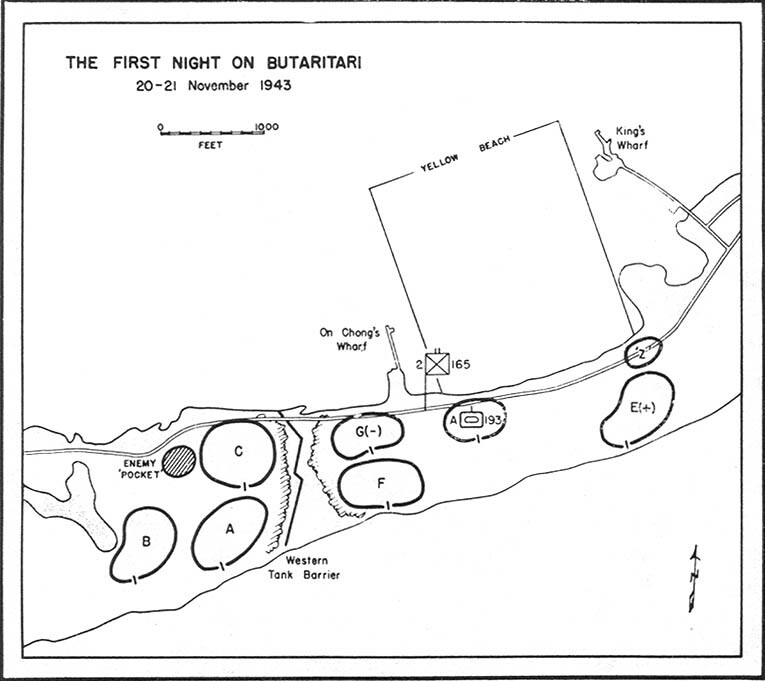 Daylight operations on Butaritari closed on the 22d November, the third day of operations, with the various elements of the 27th Division Task Force more widely scattered than on any preceding night. While the ships withdrew according to the standard pattern, and air activity subsided, plans were being made and orders issued for the next day's program. Reembarkation was to begin. A captured Japanese marine was to be sent, if possible, to use a public address system to persuade others to give up and to surrender. A reconnaissance was to be made of the remaining islets of the atoll. The day's casualties, 6 dead and 17 wounded or injured, were approximately one-half those of the previous day, while the enemy had lost 99 prisoners and an estimated 100 dead. The operation seemed about complete, with only mopping up to be done. Admiral Turner announced the capture of Makin "though with minor resistance remaining" and congratulated General Ralph C. Smith and his force on their expeditious success. About 5,000 yards of Butaritari Island remained to be combed for isolated, stranded enemy. Their escape across the reef to Kuma Island at low tide was barred by the expedition under Major Bradt. Late in the afternoon, his force had set up one platoon in a defensive line south of Keuea village, another at the southwestern projection of the island, and a third on the three small outcroppings of the reef to the southeast. The bands of fire obtainable from these positions at the reef made its crossing impossible. of island, the perimeters developed a strong barrier to enemy passage. At the north, Company I covered the lagoon shore, the main island highway, and about 300 yards of the island's width. In an oval clearing in the center of the island, two small ponds intervened between Company I and Company K, which set up a perimeter covering the southern third of the island's width. 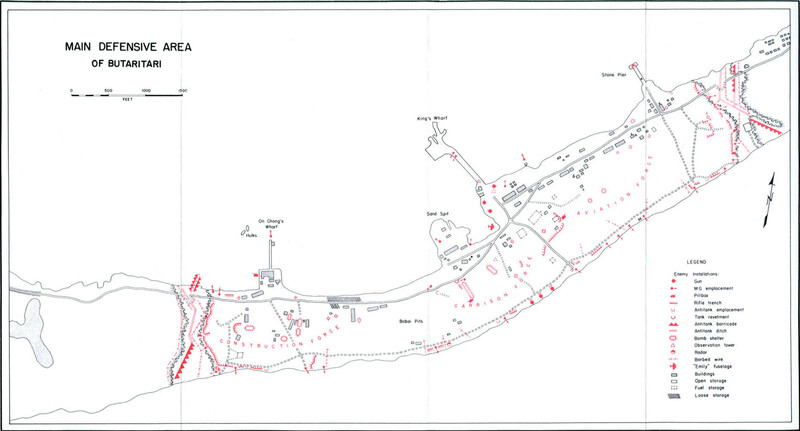 West of them, in a long, narrow oval running all the way across the island was Company L. On the eastern and western edges of these three positions, and again on the lagoon side of Company I's and the ocean side of Company K's areas, several machine guns were placed, while the highway was covered by two pairs of 37-mm antitank guns, one pair facing east and the other facing west. Company M was split up to support the heavy weapons positions along the eastern fronts of two perimeters. The men in these three adjacent perimeters had left their entrenching tools with their packs early on this long day and in addition, were dead tired. Their foxholes were shallow, consisting sometimes merely of pieces of coconut log ranged around as a protective bulwark. Positions selected for the mounting of machine guns were chosen with less care for an open field of fire than would have been the case had not the troops, like the higher command, concluded that the enemy were almost eliminated. At several points the undergrowth was thick enough to furnish considerable cover for infiltrating Japanese. The men were instructed not to use rifles, however, except for the repulse of a direct attack. The enemy came upon them as soon as darkness had fallen. First they sent ahead a party of natives who sought to pass through the perimeter to their hamlet farther west. Then the Japanese themselves came down the road, imitating the cries of a baby in an effort to pass themselves off as another native group until they had reached the American lines. The ruse was recognized, a challenge was given, and machine-gun fire poured among them just before they had deployed. wounded. Barefoot Japanese fan upon the fox holes and the gun positions, fired at almost point-blank range, and jumped into a melee with the Americans, who killed them with knives or clubbed weapons at the end of a yelling, shouting struggle. Grenades sailed back and forth from one side to another. One sniper, shot out of a tree, landed in a foxhole beneath him occupied by a company commander. Between attacks, the enemy crawled back to their own lines to drink saki from glasses whose clinking, amid sounds of drunken gaiety, could be heard by the silent and isolated Americans. Some Japanese carried canteens of liquor, and one was found at daylight, standing beneath a tree, alternately shooting a few rounds and singing loudly and unpleasantly. In fox holes beside the guns, wounded, determined Americans soberly held on as their weapons went out of commission and their ammunition ran low. At one point, they could hear a clock with chimes striking the hour in a primitive grass but close at hand, and thus they were made more strongly aware of the dragging passage of the night. just before dawn, the oil and patches in a spare-parts kit ignited and burst into flames which illuminated one post. Rifle and machine-gun fire then rained on the spot from the Japanese. At some points, mortar fire also fell. Daylight alone brought relief. Three dead and 25 wounded lay in the American lines. Fifty-one enemy dead were counted in front of American guns, but the enemy's casualties were riot computable, since the wounded had dragged themselves, or been taken, back into the woods to die. All positions remained in the defenders' hands, and the survivors around the pivotal machine guns and antitank guns on the left flank, who had been engaged throughout the night, rejoined their units when they formed up for the advance. The Japanese action on what came to be known as "Saki Night" may have beer] heavy patrolling," or "banzai attacks," but it was the last concerted resistance by an utterly desperate remnant of the original Japanese force. Some of the enemy tried to move out of the swamps south of Tanimaiaki village that night by crossing the reef to Kurria Island. At midnight about ten of them approached the 105th Infantry detail's defense line there and were either killed or wounded in the attempt to cross. Unless others had gone beyond Kenna. before the detail arrived, the last vestiges of the original Japanese forces were destined to be pinched off on 23 November, D + 3. On the fourth day of the Makin operation, as preparations for the withdrawal of the Northern Landing Force began, regimental headquarters awoke from a calm night to discover that its wire communications with the 3d BLT were broken. In ignorance of "Saki Night," headquarters prepared a detail to appeal over a loudspeaker to the group of Japanese believed to be hiding near Tanimaiaki village and to invite them to surrender. The village lay at the eastern end of the island highway, on the lagoon shore, and beyond it, like a large "V" lying on its side, the island came to its easternmost tip and bent back, northwestward, around an inlet of the lagoon. The medium tanks returned from bivouac to join the 3d BLT near the Bight, and their movement had broken the line to regimental headquarters. The tired battalion formed for the drive ahead to the tip, and to mop up what remained of the enemy in nearly four miles of narrowing, zigzagging island. In a light tank, 1st Lt. John T. Farley, artillery S-2, reconnoitered Tanimaiaki village without seeing the enemy or receiving a shot. An advance party, Company I, was sent along the road to the village to comb the region beyond it. As many as possible clambered on the outsides of the tanks, 5 lights and 16 mediums, and rode slowly forward, while the rest of the men trudged along the highway on foot. the highway, the jeep came under sniper fire for about 300 yards, and shortly afterward found friendly troops from Company L.
was coming, the 1st Platoon pushed on alone for a mile and a half next to the ocean shore. Two light tanks under 2d Lt. George P. Evans joined the 2d and 3d Platoons, and after silencing the enemy, tanks and infantry moved together to the left, went along the highway, and came up to the line of the 1st Platoon. A portion of the island was thus very lightly combed. By 1000, their advance brought them to a second aggregation of snipers, that past which the broadcasting detail had just driven. 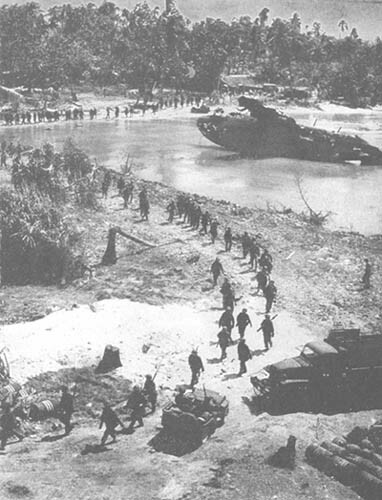 TANKS RETURN FROM EASTERN BUTARITARI after pushing with 3d Bn to island's tip on 23 November 1943. Enemy resistance has dropped to scattered, desperate parties. Medical aid crew waits beside the highway with its jeep while No. 19 (S/Sgt. Doyle Major) rolls past. 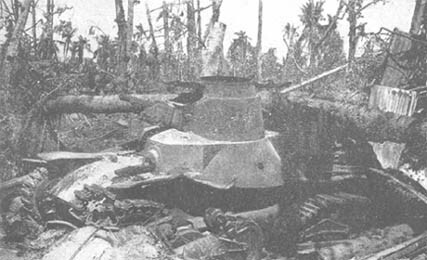 Two miles farther the advance party of tanks and riflemen from Company I, after passing beyond Tanimaiaki village at about 0900, stopped while the riders dismounted and turned into the woods to the south. To search the area in detail, Company I formed a skirmish line. Company K overtook the line and filled in its right side, along the ocean. They proceeded for 2,000 yards out to the easternmost tip and then back, northwest, to the very end of Butaritari Island. After crossing a crudely built coral causeway, they came upon an air-raid shelter in which a grenade and 37-mm fire from the tanks killed two of the enemy. About 200 yards farther a second shelter was encountered near the ocean shore. It was father lightly constructed, and after Capt. John J. Walsh of Company K had crawled forward and tossed in a grenade, 2d Lt. Lloyd Welsh and Sgt. Robert L. McCoy, Jr., removed the top logs and exposed nine stunned Japanese. They were disposed of by thorough rifle fire, which killed one who had been shamming. A smaller detail investigated a tongue of land which projected into the lagoon northeast of the village. There they found only one enemy officer, asleep. At 1030 the forward units of the 3d BLT reached the extremity of the island. They had found and killed three of the exhausted enemy in the woods, but in the remaining underground shelters bad discovered only caches of food. As they looked across a mile of shoal water to the small islets and the tip of Kuma, they could feel that the task force had attained its objective. "Makin taken," General Ralph C. Smith reported to Admiral Turner. "Recommend command pass to commander garrison force."